It's been less than a week since the Virginia General Assembly began our 2012 session, but with the hectic pace, it sure feels like we've been here for many weeks! 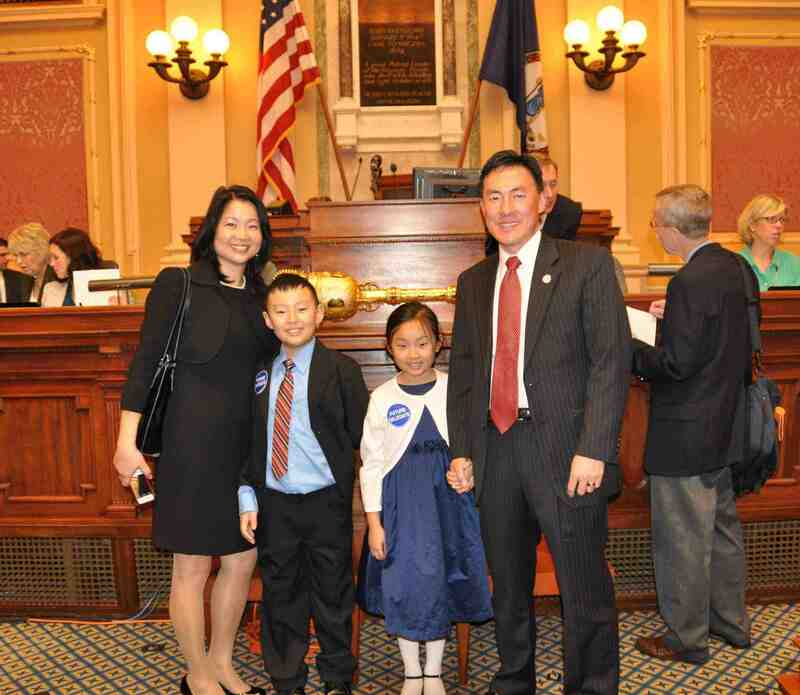 We had an exciting first day of session on Wednesday, January 11, and I was glad that my son Tyler (10) and daughter Brenna (8) were able to join Alex and me in the Chamber as I took the oath of office to begin my second term in the House of Delegates. Now that the General Assembly is in full swing, I will send out regular email updates from Richmond. I will try to keep these to about once a week, depending on how much is happening down here. In this report, I want to tell you about my Committee assignments, the bills I have introduced so far, and the upcoming Town Hall meeting this Saturday. Last week, the Speaker of the House appointed me to the House Education Committee where I have been named to two Subcommittees: "Students and Early Education," and "Teachers and Administrative Action." I'm pleased to be on this Committee where I can have a first-hand opportunity to shape the policies of our Commonwealth that impact our schools, kids, teachers and parents. As you may know, my wife and I both came to America when we were kids. We are constantly reminded of the sacrifices made by our parents who worked hard to ensure that we have educational opportunities in America that they never had in Korea. I am absolutely convinced that neither Alex nor I would be where we are today without the great education we received from public schools. One of my motivations for running for office was to ensure that our schools remain strong so that every Virginian has a chance to succeed. I am glad to see that Governor Bob McDonnell has made education one of his priorities in this session. I look forward to working on the House Education Committee to seek common ground with the majority party, but to also challenge the Governor and his Republican colleagues if they attempt to undermine the world-class status that our public schools enjoy. I continue to serve on the House Finance Committeehttp where important fiscal and tax policies for the Commonwealth are considered. This week, I introduced a dozen bills that focus on additional funding for road maintenance, assisting small businesses, helping military service members, veterans and their families, fixing problems that local governments encounter in dealing with residential constructions and providing property tax relief, and addressing inadequacies in criminal and election laws. Links to each of these bills are on the right if you want to read the specifics and find out their status. By the way, if you are a frequent user of the VA Legislature's website, you will note that we now have a new feature. Based on my resolution with Delegate Jim LeMunyon that was passed in 2011, you can now search for all of our recorded votes from the House of Delegates website using our names instead of bill numbers. Check out this link and click on "See how my Delegate voted" section to see how I voted so far this year. Once you're on the page, look for my name (or the name of any Delegate) on the drop down menu. The software has a few kinks to work out but it's definitely an improvement from the old system that made the research process extremely difficult for you. Finally, please join State Senator Chap Petersen and me for my first town hall meeting scheduled for this coming Saturday, January 21, in Vienna. This is the third year that I have held this town hall, co-hosted by the Ladies Auxiliary of the American Legion Dyer-Gunnell Post 180. Everyone is welcome to learn about this General Assembly session and to have your constituent needs addressed. The address of the Legion Hall is: 330 North Center St, Vienna, VA 22180.